Dunton Locks County Park is a 53-acre park nestled on the quiet shores of Muskrat Lake and Lake Sallie. The park is located just three miles south of the city of Detroit Lakes on US 59, then one-third mile west on Co. Rd.6, then south again on Co. Rd. 19 to Dunton Locks Road. (Click here for a map). 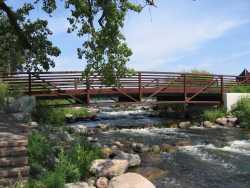 The park is also accessible by bicycle, roller blades, or by foot by using the Fish Hatchery Recreation Trail located on West Shore Drive near the Pelican River. This quiet, year-around park contains two picnic shelters, hiking & mountain biking trails which double as cross-country ski trails in the winter, a paved recreation trail, interpretive history signs, two fishing piers, and a mechanical boat tram that transports boats, PWC, and pontoons between Muskrat Lake and Lake Sallie, allowing boat travel from Detroit Lakes to Shoreham. Picnics are common at Dunton Locks Park and we have the facilities to accommodate almost any size group. 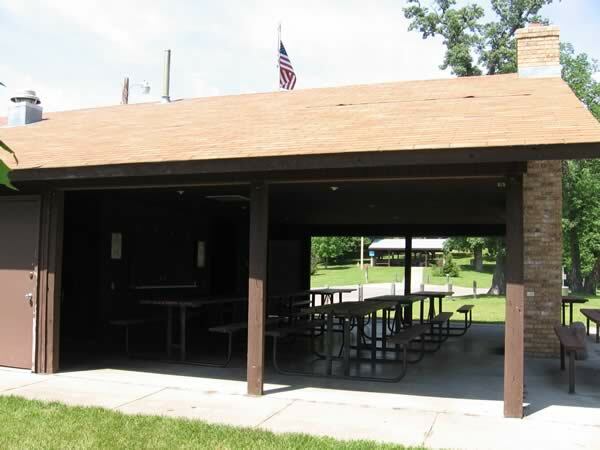 The VFW Shelter ( see photo), located near the shore of Muskrat Lake, contains modern restrooms and a modern kitchen complete with stove, refrigerator, sink, indoor charcoal grill with exhaust hood, a food service area, and electrical outlets. The shelter has covered seating for 48 people plus outside seating for an additional 12 persons. The Eagles Shelter ( see photo), located on the hill overlooking the park area, has electrical outlets, an indoor charcoal/wood fire grill, and covered seating for 48. 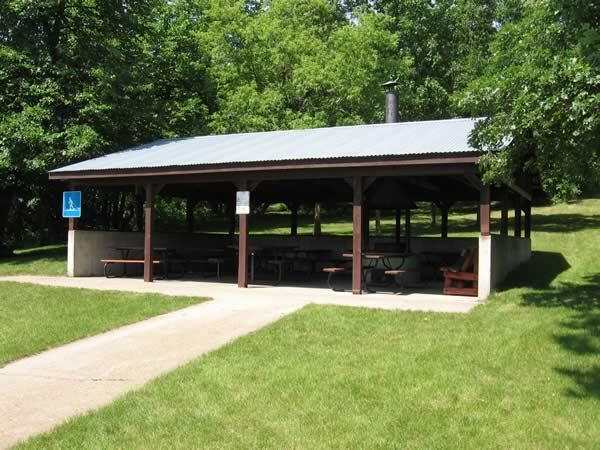 Both shelters can be reserved for family reunions, weddings, meetings, or business/organizational gatherings. To reserve either of these shelters please phone us at 218-846-2612. For the nature lover, Dunton Locks has 6.1 km of hiking, mountain biking and cross country ski trails located on the hills above the Eagles Picnic Shelter and along the shores between Lake Sallie and Muskrat Lake, south of the bridge. The northern trails wind through hardwood forested hills once a gathering spot for the Sioux Indians. Remnants of Indian burial mounds are still present throughout the park. In fact, much of the park area was a gathering area for netting tulabies, camping, and trading. The southern trails also wind through rolling, wooded terrain, however much of the trails are located on private land owned by the Soo Pass Ranch. This land is used for camping during the several music festivals the Soo Pass Ranch holds each year. For a map of the trails at Dunton Locks Park click the following link: Dunton Locks Trail Map. For those more interested in history of the area, check out the mechanical boat tram located just south of the bridge. Back when the Detroit Lakes area was first being settled, the Detroit Lakes and Pelican River Slack Water Navigation Company devised a grand scheme to install a series of locks and dams to accommodate steamship traffic from Breckenridge to Detroit Lakes, thus the name Dunton Locks. While the plan was cut short, it did inspire a group of local entrepreneurs in the mid 1970s to try to duplicate the effort, only on a much smaller scale. This group designed, built, and maintained a mechanical boat tram to promote dinner excursions between Shoreham and Detroit Lakes. The County has since taken over the operation of the tram as a local tourist attraction.